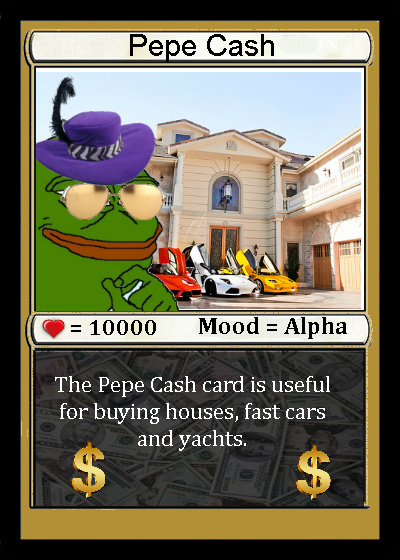 PepeCash is a card just like the other cards on this directory, except it is alot more liquid. About 700 million Pepe Cash are in circulation at the moment PepeCash is meant to be the currency of the Pepesphere. Pepecash is needed to pay your submission fee to get your Rare Pepes into this directory, and into the wallets. Some people are also working on games that use PepeCash. Keep track of the PepeCash price with this Android ticker. How was PepeCash distributed initially? 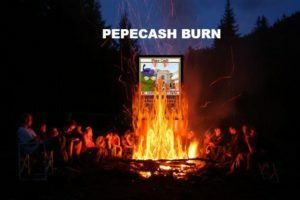 After RAREPEPE, GOXPEPE, AND SHITCOINCARD were sold to buyers on the market, PepeCash was distributed to all of those holders. A portion of PepeCash was also donated to FoldingCoin miners. After some giveaways on Twitter and in the Telegram chat, the rest was burned. (About 300 Million). How secure is the PepeCash Blockchain? Pepecash uses Counterparty which uses the Bitcoin Blockchain.